The Tappex Trisert® range of threaded inserts for plastics has been developed for various environments and application criteria post-mould installed. It includes three primary designs– double ended, reduced headed and headed, all available as normal and close-limit variants; lengths normally stated in mm. Three primary and three secondary equidistant cutting flutes over the length of the external form, give a more balanced cutting load than other forms of self-tapping insert (sometimes called: ‘self-threading’). The cutting action takes place at a larger number of points on the thread form over the length and circumference of the insert. Lead-in feature on both ends allows the insert to be installed either way up which facilitates ease of handling. Therefore, where the volumes dictate that bowl feeding equipment is required, for example, it is not necessary to incorporate complex flighting or routing-systems to orientate the insert which makes bowl feeding simpler and reduces overall process-tooling costs. Free running internal thread due to there being no interruption to the internal thread, as the external longitudinal flutes produce the cutting action during installation. Reduced outward stress – during the installation process the cutting action of self-tapping inserts results in slight outward stress. This is reduced to an absolute minimum with the Trisert® and enables the insert to be used in more brittle materials and also where there are thin wall-sections. Improved axial alignment – the balanced cutting load of the Trisert® reduces side thrust often caused by if only one cutting edge is available. 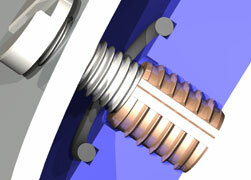 Overall, this has the effect of guaranteeing much closer axial alignment of the insert in the hole. 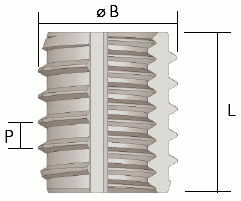 The reduced headed version of the Trisert® incorporates the same special truncated thread form containing three primary and three secondary equidistant cutting flutes, but provides the designer and production engineer with a higher performance flush fitting insert to match product availability to common assembly problems. 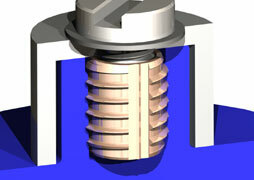 Reduced head at the same diameter as the external truncated thread form provides an increased bearing surface. The headed version of the Trisert® incorporates the same special truncated thread form containing three equidistant cutting flutes, but provides the designer and production engineer with standard options to match product availability to common assembly problems. Large diameter head prevents jack out in applications where elongated slots or larger than standard clearance holes are necessary in the mating component. It has a larger bearing surface that is required in high torque applications. The Tappex Trisert® can be installed using our specifically designed Tappex FlexiArm®, 035 series used in conjunction with our production drivers (029 series), which provides a method of accurately installing inserts at various heights and positions in a moulding. 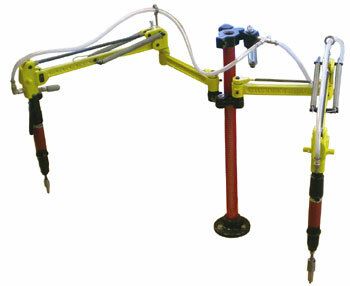 Click the videos tab to see the FlexiArm® in use or check-out our videos on You Tube. Alternatively, Tappex Trisert® inserts, in low quantities, can be installed by hand quite efficiently using our 031 range of hand installation tools that come complete with alignment bushes to aid inserts being installed perpendicular to the workpiece of substrate’s surface. Please contact our applications department for further information and details. REACH/RoHS compliant as per the candidate list of substances of very high concern. Finish: Self-Colour. Special finishes to customer requirements, at extra cost. Description: The Trisert is a self-tapping insert. Its main feature is a truncated external thread form with three equidistant main and three secondary cutting flutes. Application: Offers higher tightening torque's and increased bearing surface for use with softer mating components. Use where a flush fit is required. Trisert Advanced should be specified for thin walls, hard Urea, Melamine and Phenolic materials or similar. 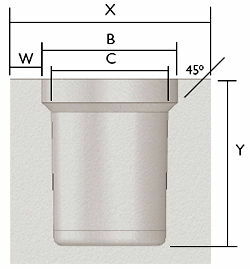 Hole Size: Moulded and drilled hole diameters vary dependent upon installation technique, specific component geometry and plastic material. Please consult our technical department for a precise recommendation, to ensure optimum production conditions. Sizes given are for reference purposes only. Installation: Self-tapping using a hand tool (part no.031) or reversible drive mechanism. Tappex offer pneumatic reversible tools mounted in a Tappex FlexiArm, used in conjunction with a Tappex production driver (part no.029). The following are downloads relating to the Trisert® range, although a downloads may also be applicable to other product ranges. General information can be found on our downloads page. Details of Production Driver Function, Identification, Dimensions, Suggested stock, and Troubleshooting. Tappex Hand Tool description, instructions for use, and maximum torques.